You just don’t expect to find wetlands in the desert. 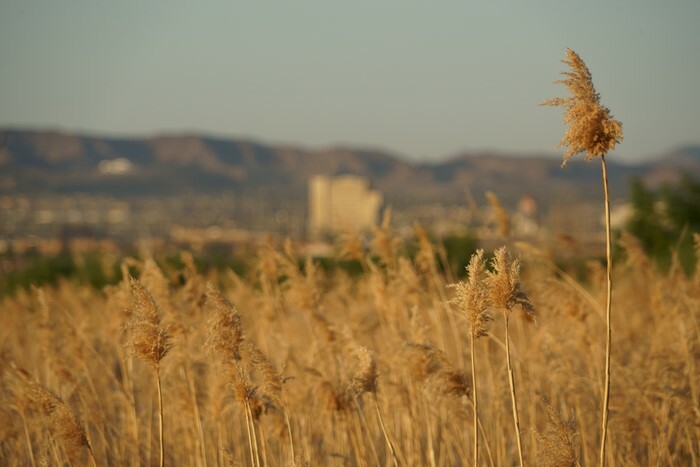 But, out on the eastern edge of the urban sprawl of Las Vegas, that’s exactly what you’ll find: a lush waterway populated with all sorts of water birds and other wildlife, all within view of the Las Vegas skyline. 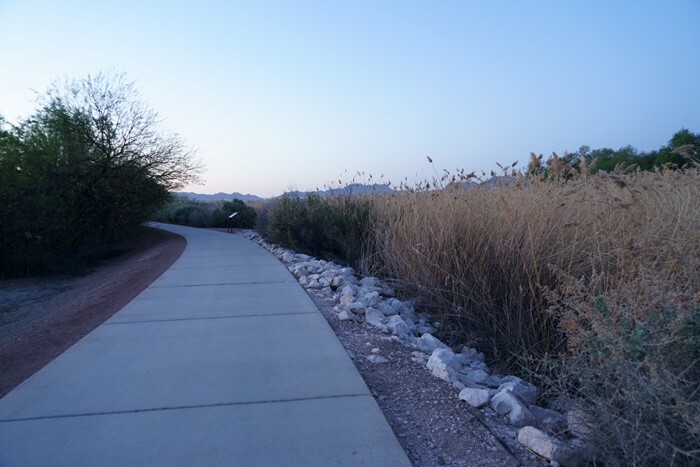 This is the Clark County Wetlands Park — and while it’s far from the pristine nature experience you might be hoping for, it’s still an interesting place to escape from the nonstop rush of Sin City. 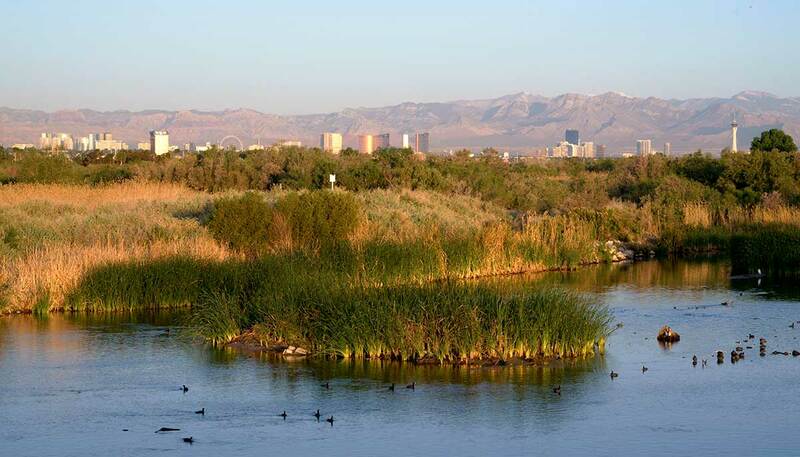 Clark County Wetlands Park is located directly east of McCarran Airport and the Las Vegas Strip. From the Strip, take Tropicana Avene as far as you can go. (From I-515, exit onto Tropicana and head east). As Tropicana turns south and becomes Broadbent Boulevard, watch for the turnoff onto Wetlands Park Lane. On my short vacation to Las Vegas, I was staying with a friend and using her car to get around town. That was a great solution, except for the fact that she needed to be at work at 4 a.m. – which meant I had to be up very early on a couple of days. 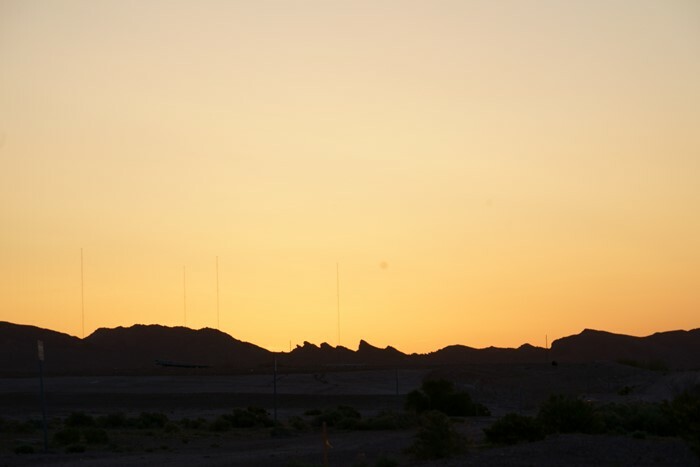 No problem, though — I figured I’d use it as an excuse to photograph a beautiful desert sunrise. And, since my friend worked in Henderson, I’d be fairly close to Clark County Wetlands Park, which I figured might be a nice place to start the day. So, just as daylight broke, I headed to the park. This is a well-developed park that provides numerous walking trails, some wildlife viewing opportunities, and a field-trip destination for just about every kid in Vegas, I’d assume. It opens at sunrise (with no admission fee), and although I arrived a few minutes before it technically opened, I wasn’t hassled. There’s a big parking lot and a nature center at the center of the park. 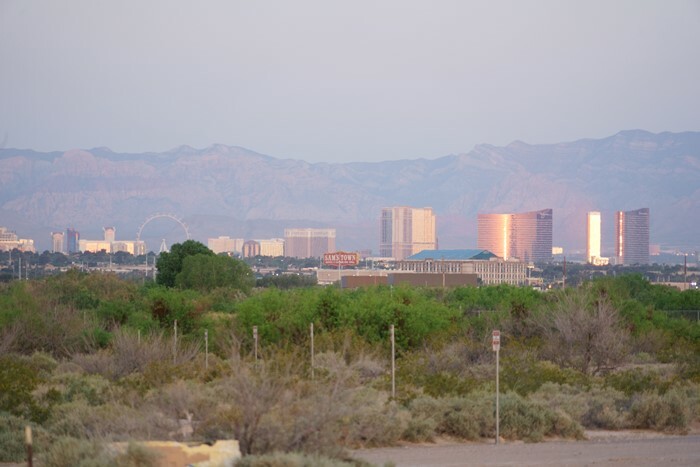 I was far too early to check out the nature center, so I bypassed it and set out on a trail, hoping to find a good spot with a view of the eastern sky — or a nice view of the strip. The first thing I noticed was the lights of Henderson, Nevada. Most of that city is south of the park, slightly separated from the rest of the Vegas valley. 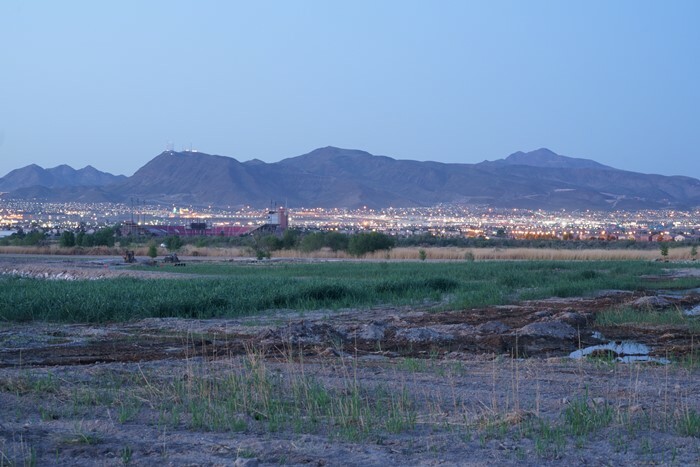 The land slopes up as you approach Clark County Wetlands Park, which gives you a nice view overlooking the lights of Henderson. 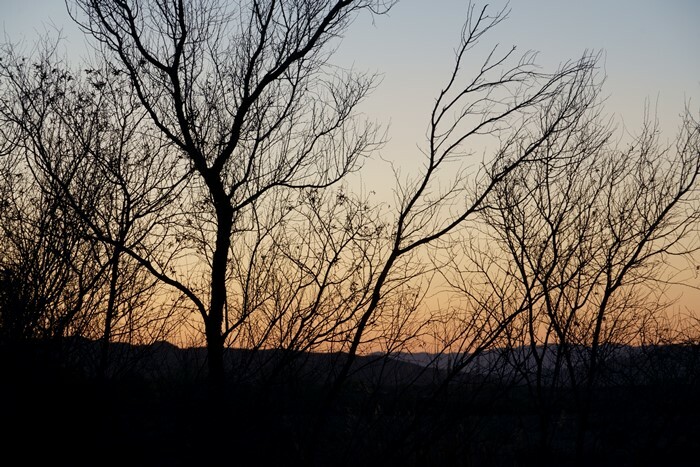 The brush along the trail also provided some nice silhouettes against the sky. Surprisingly, though, I was very cold. It was early April, and the summer heat had not yet arrived in Las Vegas. There was a breeze, and the air was cold, but I was dressed for the warmer temperatures that would arrive later in the day. As the sky grew brighter, the view back towards Henderson no longer revealed lights, but I could see some towering casino buildings on the horizon. … I finally found a clear view, although it wasn’t perfect. Look closely and you’ll see some radio towers mixed-in with the jagged hills to the east. I found this view by walking up to the Las Vegas Wash — a waterway that flows through Clark County Wetlands Park — then crossing the Weir Bridge to the other side. There are power lines that run along the wash, so if you want to get clear of them for a photograph of the sunrise, you’ll need to do a little extra walking once you cross the bridge. There are trails on the east side of the wash, as well, that loop around and return to the bridge. … and zoomed in the best I could. Even though this was a great time of day to shoot the skyline from Clark County Wetlands Park, I couldn’t find a place with a perfect view. Even though the pictures weren’t great, it was still neat to realize that I was this close to the Vegas strip, yet surrounded by wilderness. 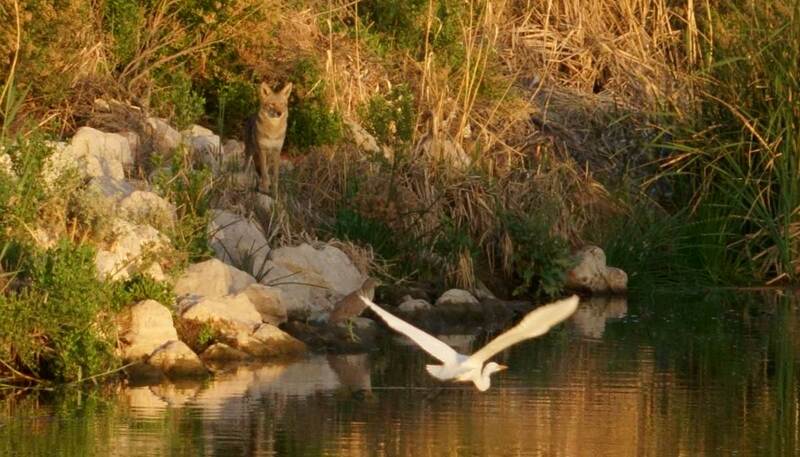 … and if you look closely, even a coyote! My camera zoom was maxed-out to get this picture, but if I had a better zoom, I really could have taken some beautiful nature photos. But before I make the Clark County Wetlands Park sound idyllic, let’s have a reality check. The waterway is very trashy. Garbage is everywhere, trapped in the weeds and lodged on the shoreline. Also, at the bridge, you’re directly downstream from a water treatment plant, so most of what you’re seeing is actually sewage water. The treatment leaves the water with an odd air-freshener smell that constantly reminds you that this isn’t a pristine environment. It is, however, a nice place to go for a walk and see some wildlife, if you happen to be in the area. I would not suggest you make a visit to Clark County Wetlands Park a priority on your Las Vegas vacation. 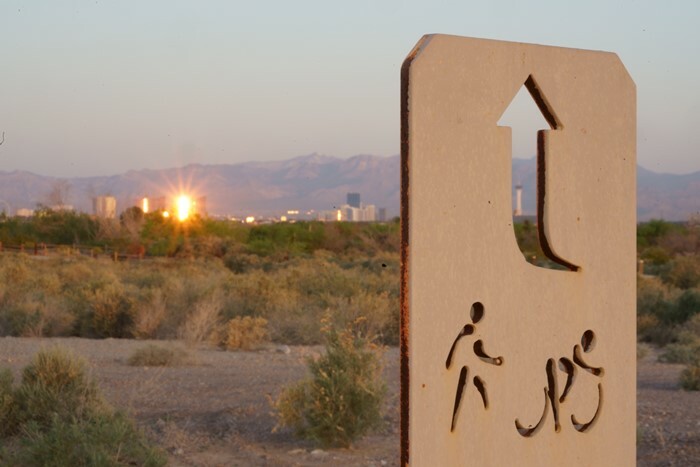 While the park provides a nice escape from the Vegas concrete jungle, and you might see some wildlife, you’ll also see a lot of trash, and endure a weird smell. It’s also not a great place to see a sunrise — however, you probably could see a nice sunrise if you go a bit further east, possibly along Hollywood Boulevard, which is on the east side of the park.